With investor attention increasingly focusing on what most believe will be the catalyst for the next financial crisis, namely a tsunami in corporate defaults as a result of the disastrous combination of record leverage, higher rates and an economic slowdown, overnight we presented the view of FTI global co-leader of corporate finance and restructuring, Carlyn Taylor, who predicted that "a spike in defaults is on the way, sooner or later." The expansion is pretty long in the tooth and there's definitely a lot of buildup. The activity level of restructuring is rising, maybe not at the rate of bankruptcies, but the pipeline of companies we think are going to end up in restructuring, based on metrics that we analyze, that volume has gone up. And we're so busy, which we don't think is just market share, because we think our competitors are also very busy. ... a growing number of strategists are warning that corporate bond market illiquidity is an even greater risk factor. Not long after Goldman most recently warned that the biggest threat facing the broader market in general, as well as corporate bonds in particular, is a sudden collapse in liquidity, overnight UBS credit strategist Steve Caprio and his team laid out four major reasons why global corporate bond market liquidity has deteriorated over time. Potential new EU regulation on trade settlement failures. UBS notes that credit investors were shocked by the spread blowout in Q4'18, followed by major spread tightening in Q1'19, and notes that "these spread moves are worrying in that they are somewhat divorced from fundamentals, as default risks remain low." The bank then notes that it believes these shifts in risk premia are likely to remain with us for the foreseeable future, and as evidence is uses a novel liquidity tracker by the Intercontinental Exchange which highlights that global HY bond liquidity has been deteriorating steadily since 2016, while the bank's own simple measure of gauging HY liquidity, through the beta of spread changes to flows, is also elevated. There are two other critical reasons for the collapse in liquidity, one of which is central banks themselves. As Caprio notes, credit returns will be more negative in the future when fundamental stress arises, because there is less (US) or no (EU) room for sovereign yields to fall further. 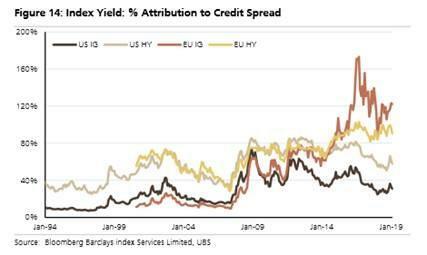 The % of index yield that is spread ranges from 31% and 58% in US IG and US HY, to 100%+ in EU IG and EU HY. This makes global credit a less diversifying asset. The empirics bear this out, with rising correlations of credit to equity returns. In addition, EU HY finds itself behind US HY in terms of reversing the QE-led portfolio rebalancing effect. Lastly, while US IG credit can receive risk-off inflows from broad bond funds, given Treasury yields are attractive as a portfolio hedge; EU IG flows are more dependent on credit-specific funds. One additional critical reason why bond liquidity is collapsing is because US and EU dealer inventories of credit have declined notably, while dealer reaction functions to spread changes are shifting: "Pre-crisis, dealer purchases of credit were uncorrelated to spread changes. 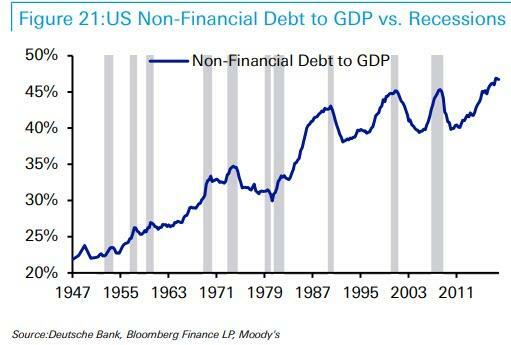 Post-crisis, dealer demand is reacting like retail funds, buying when spreads tighten and selling when spreads widen." This lack of willingness to provide liquidity, UBS warns, "is likely to remain with us, due to capital & liquidity requirements." "In a world where sudden bouts of volatility may become the norm, funds are more likely to sell bonds than dip into cash reserves to meet redemptions when the next leg of risk aversion hits. This increased concentration by investor type both with respect to subordinated debt as well as HY credit exacerbates liquidity risk further in our view, which naturally increases potential downside risk." While UBS hedged, trying not to sound too bearish, and noting that it doesn't believe corporate bond market illiquidity "will bring down a cycle on its own," the Swiss bank does expect more credit spread volatility going forward, "with the real challenge for markets taking place in a broader downturn when liquidity risk intersects with default risk", i.e., the perfect storm for the bond market. Echoing UBS, Deutsche Bank's credit strategist Jim Reid published an almost identical report at almost the same time, in which he agreed that it's not so much default risk and deteriorating fundamentals, but rather liquidity that will precipitate the next crisis. Reid writes that a look at long-term credit fundamentals shows corporates are levering up in this cycle "but that this is more of an IG than HY story and therefore reduces the default implications", although one could counter that with over $3 trillion in BBB-rated debt just waiting to be downgraded to junk, it is only a matter of time before this becomes a bigly HY story. Deutsche also notes that while leveraged loans are a concern, it’s not clear the increase in cov-lite issuance will bring large-scale defaults in the next cycle as without covenants there are fewer triggers. As a result the German bank doesn’t think corporate fundamentals will cause this cycle to turn but will clearly deteriorate when it does. The overall market dynamics have shifted aggressively since the GFC. 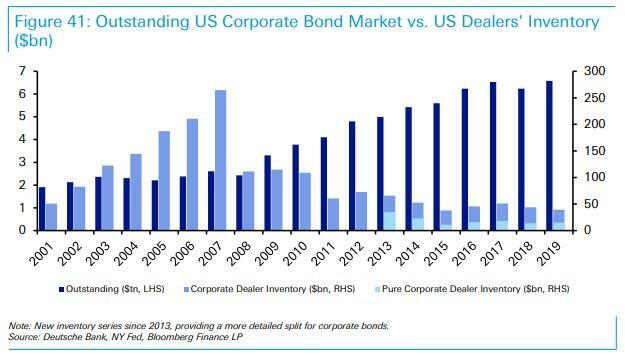 Figure 41 republishes a chart we have shown on numerous occasions over the last several years detailing that the US corporate bond market has near tripled in size since the GFC due to QE, lower yields encouraging companies to issue and high demand for fixed income and spread product, thus providing a captive pool of capital. Meanwhile, regulation has ensured dealers/market-makers have less and less ability to warehouse risk. It's quite possible the next recession will see the third-worst spread peak in history (behind only the Depression and the GFC) due to these market dynamics. ... these peaks may not last long as central banks will probably be forced to buy to ease pressure on the market. In fact, this is probably a more traditional function of central banks: to lend money to solvent entities when there is a liquidity problem. Companies are unlikely to have liquidity problems, but those holding the bond might well do. Meanwhile, keep an eye on the tsunami of fallen angles: "a large BBB market vs. HY will also exacerbate the technicals when downgrades occur." Finally as to timing, Reid warns that "as many indicators are late cycle, this is a real risk over the next couple of years."